Ron Brugal 1888 is a truly extraordinary rum produced in the Dominican Republic, It combines the rich flavors of Bourbon and Sherry through a process of double aging. Sweet and toasted aromas while in the mouth it is smooth and full-bodied. 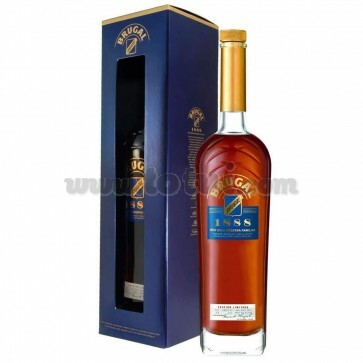 Ron Brugal 1888 is a truly extraordinary rum produced in the Dominican Republic. It combines the rich flavors of Bourbon and Sherry through a process of double aging. Dark amber color, bright and clean. Presents aromas of chocolate, roasted coffee, cinnamon and nuts. The palate is smooth and full-bodied with notes of caramel, wood and licorice. Sweet and persistent finish. It is matured for the first time in American oak barrels ex bourbon selected by hand, then, in European oak barrels, from Jerez. This mixture of two worlds gives it a complex but smooth flavor profile. If it warms up slightly until the temperature of the Caribbean climate is reached, the notes of American bourbon are enhanced. This shows its spectacular complexity with a prolonged background made of touches of vanilla, coffee, raisins and dates. As it cools the shades of Spanish sherry emerge. You will discover touches of caramel, citrus fruits, red fruits and peach, without renouncing its characteristic background.